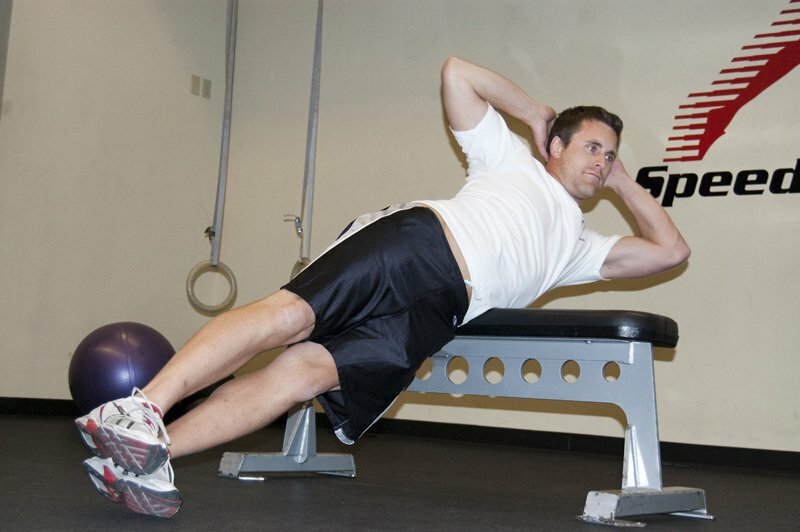 Ben Affleck&apos;s Workout Program For The Town. 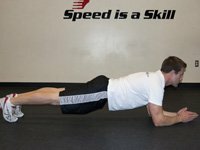 Rehan Jalali demonstrates 5 awesome exercises Ben did to build muscle with personal trainer Walter Norton Jr. Then check out Ben's complete workout. 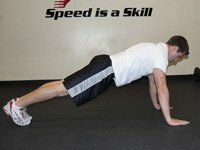 Learn exactly what he did to get shredded for The Town. 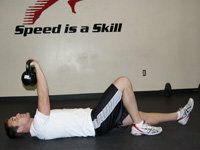 Find Ben Affleck Trains For The Town on the Video Network where you can leave comments, rate the video and download your own copy! 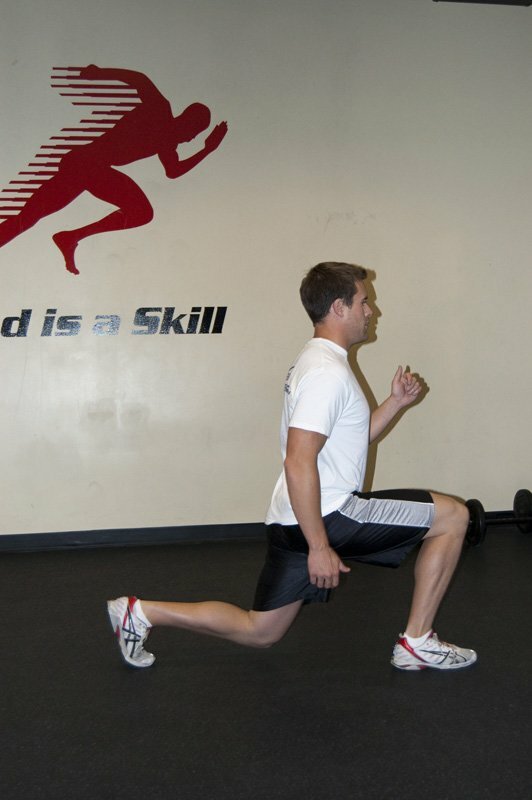 Walk forward, raising your knee to hip height without fully extending the leg as you step. 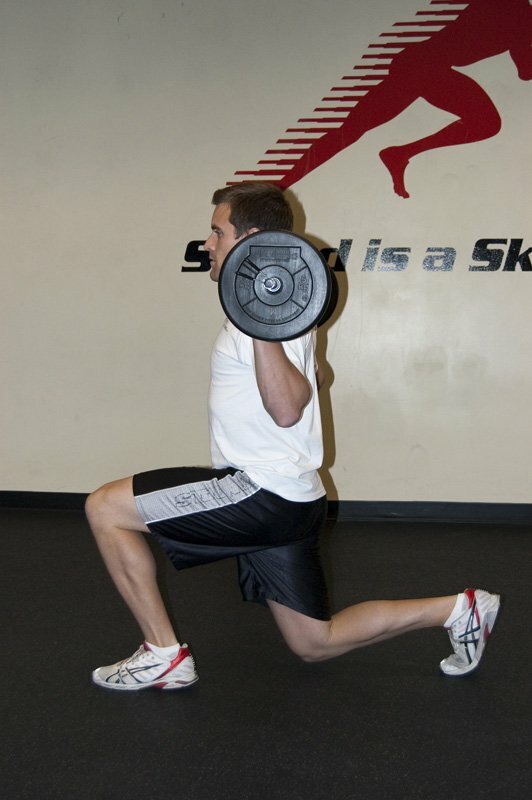 Skip forward, extending fully through your push leg as you raise the opposite knee as high as possible. Continue by alternating. 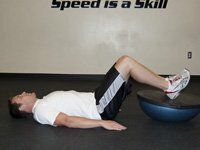 Alternate raising your knees above hip level as quickly as possible. 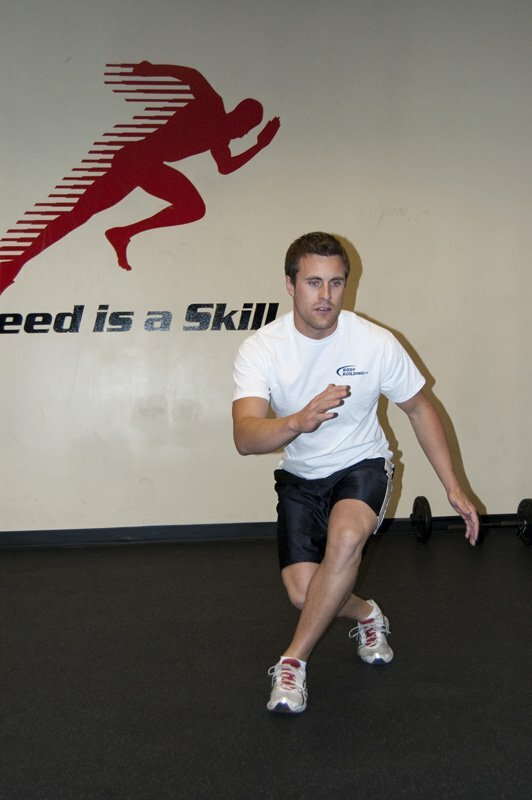 While your legs should be pumping fast, forward progress may be slow. 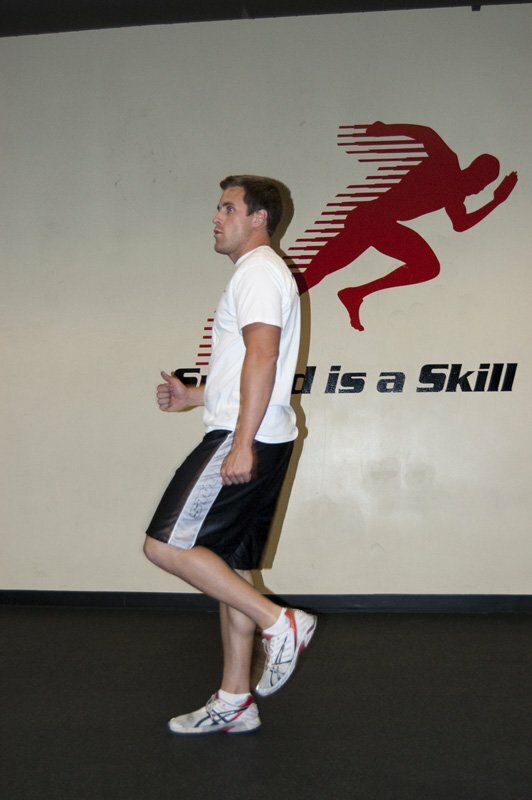 Standing sideways to the direction of travel, begin by stepping out with your inside leg to the side, and then bring the opposite leg behind it, again stepping off with the inside leg. 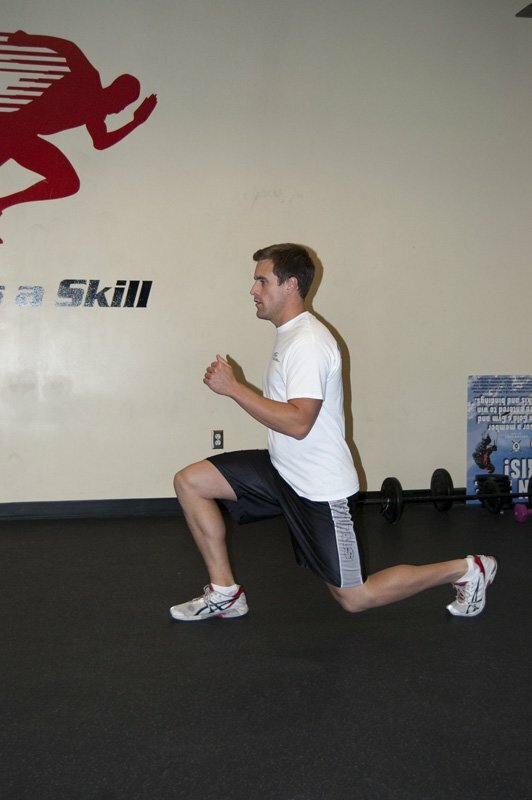 Alternate stepping in the back or front with the opposite leg to progress down the lane. 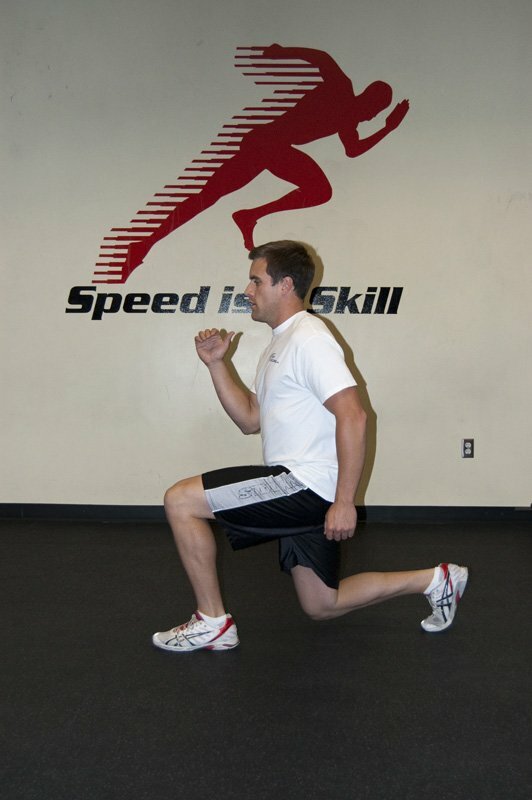 Standing sideways to the direction of travel, begin by stepping out with your inside leg to the side as far as possible, sitting down with your hips, and then bring the opposite leg behind it, again stepping off with the inside leg. 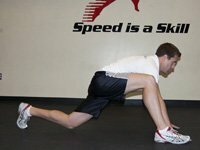 Alternate stepping in the back or front with the opposite leg to progress down the lane, keeping your steps long and your hips low. 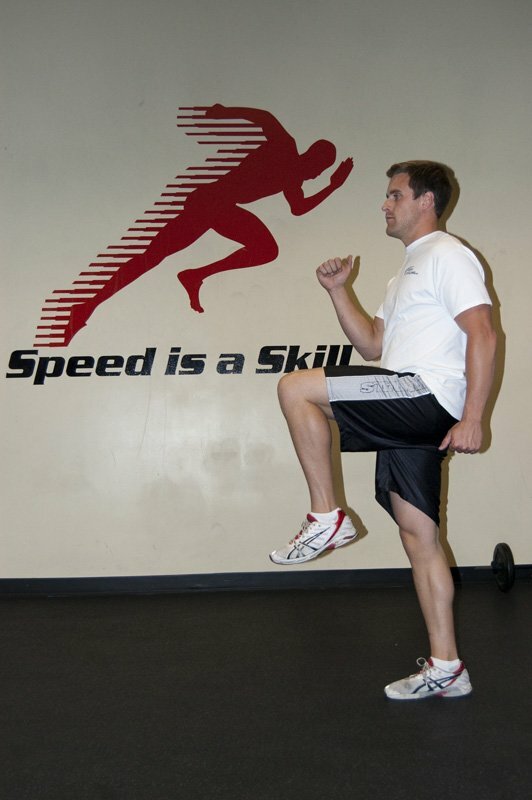 Facing the direction of travel, step forward with one foot and lower your hips until they are in line with your front knee. 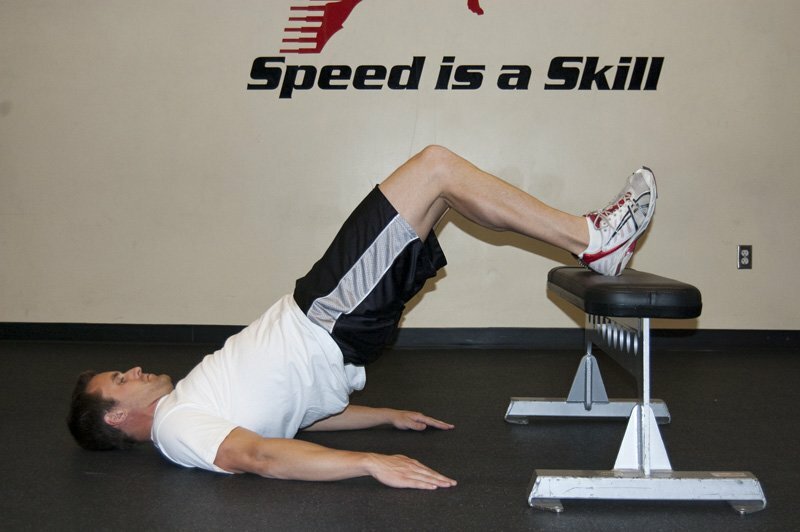 The knee should be above the foot. 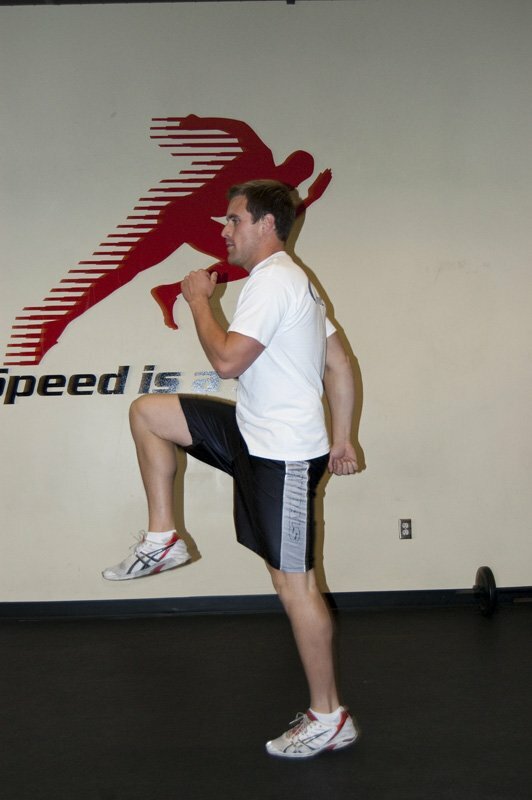 Drive through the heel to return to a standing position as you step forward with your opposite leg. Continue until complete. 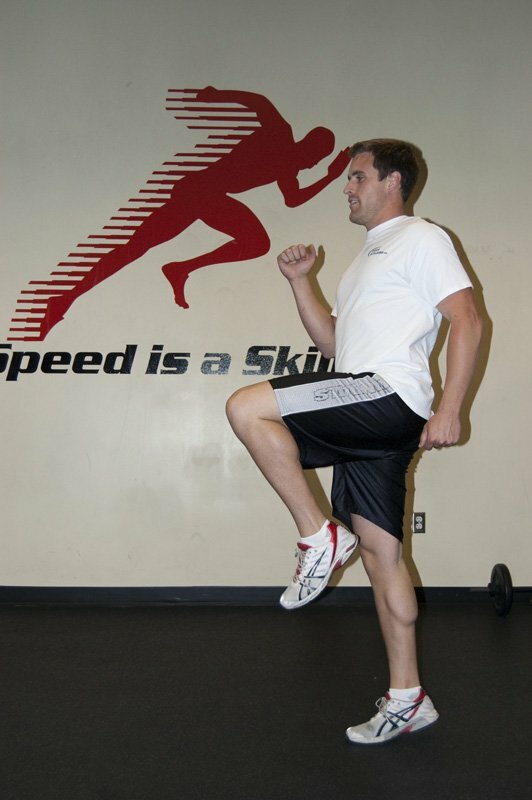 Facing away from the direction of travel, step backwards with your foot, pressing the ball of your foot into the ground as you lower hips until your front knee nearly touches the ground. 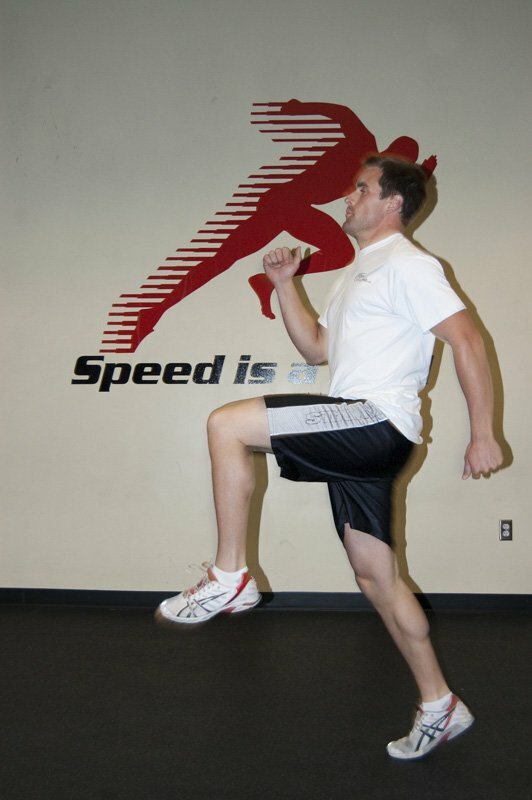 Driving through the heel of your front foot, return to a standing position as you step back with your front leg and repeat. 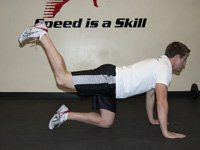 Begin by facing the direction of travel and bending over to place both hands on the ground directly in front of your feet. 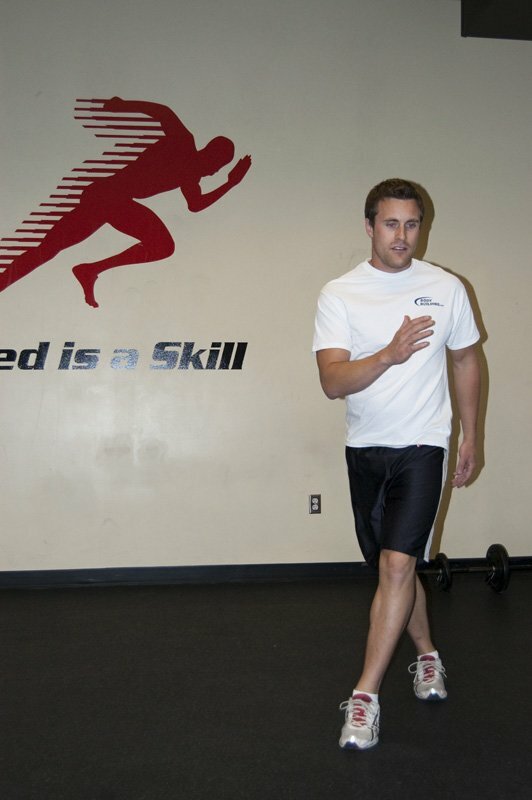 "Walk" both hands forward, keeping your feet in position, as far as you can. Now, keeping your hands in place, walk your feet forward until you return to the starting position with your toes next to the heels of your hands. 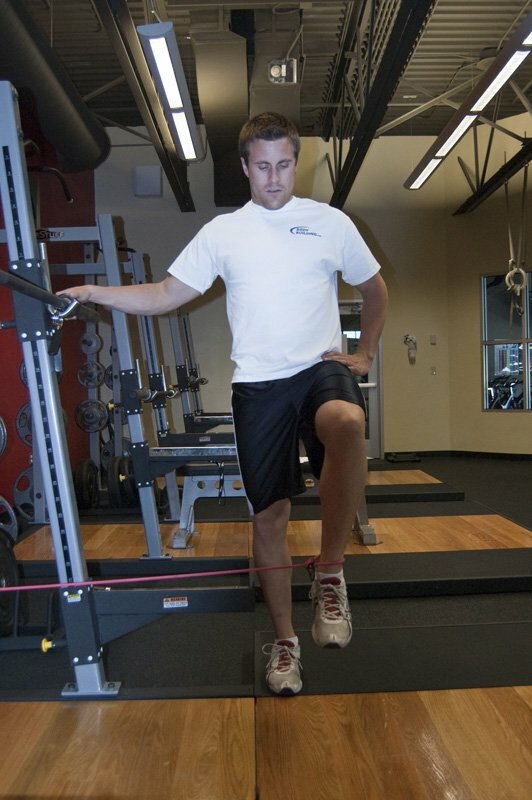 With an ankle cuff attached to one leg, raise your knee and keep it in place. 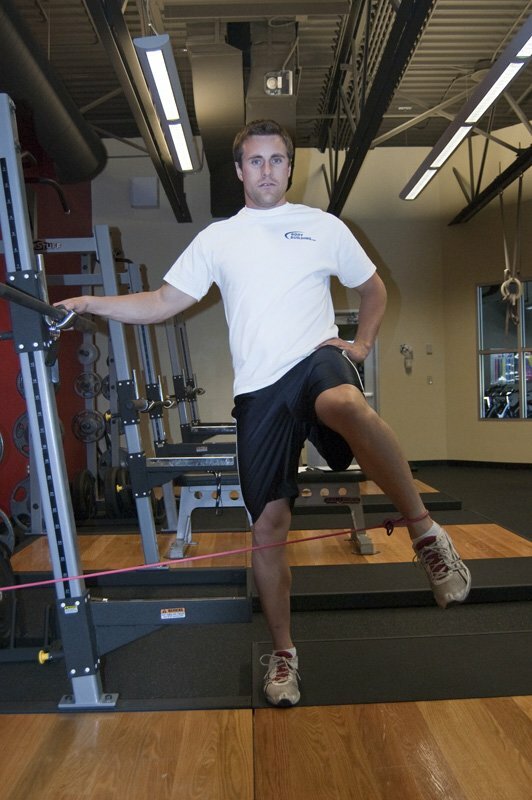 Rotate your leg so that your ankle moves to the outside of the body. 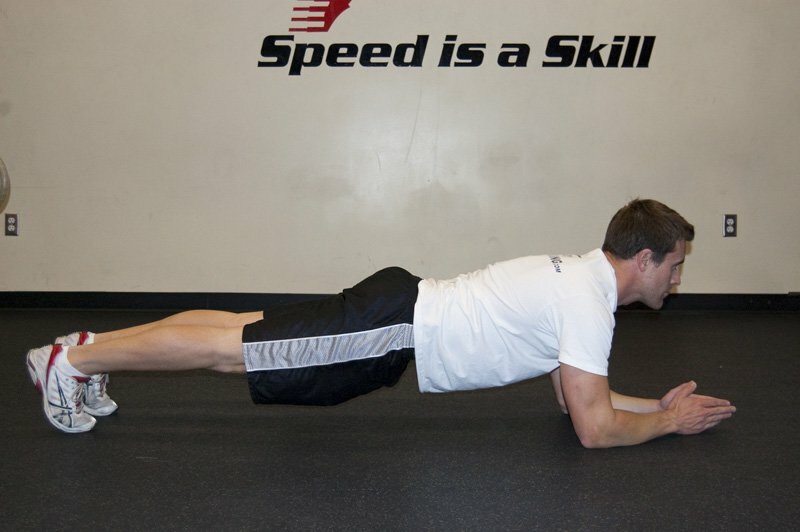 In this pushup variation, place a band around both wrists, keeping them far enough apart to provide tension. 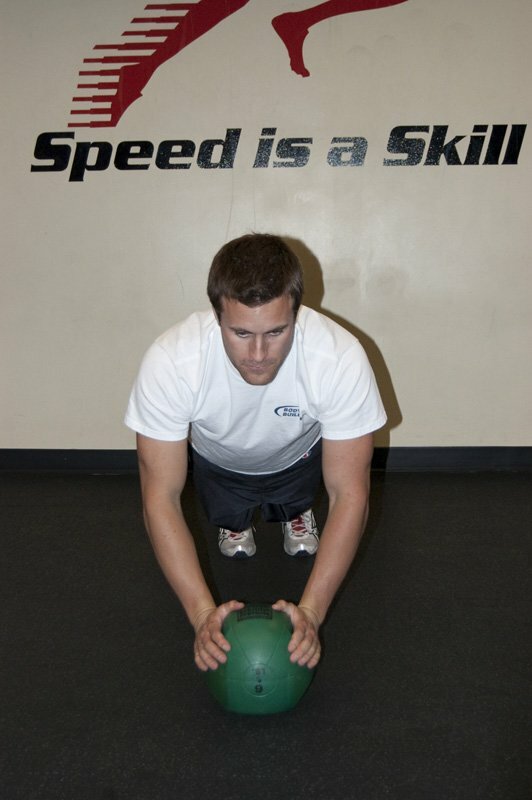 Place your shoulder blades on a ball with your feet flat on the floor. 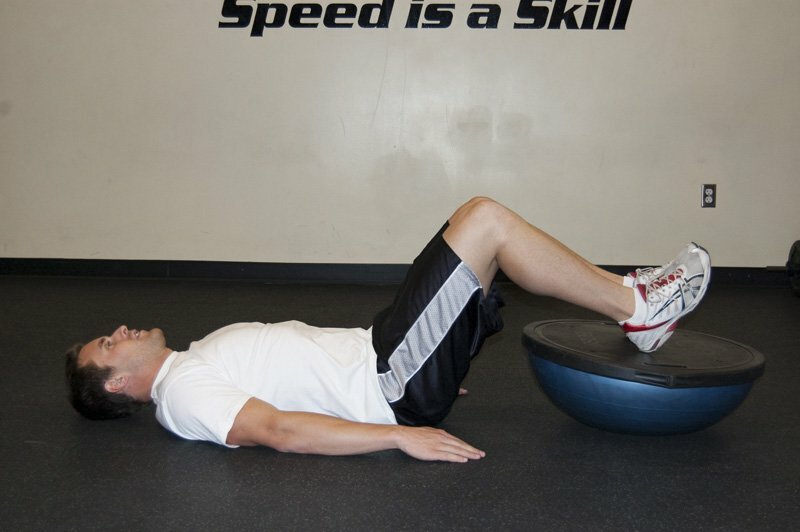 Allow your hips to drop, and begin the motion by extending through the hips. 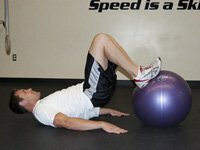 Lie with back on floor and legs straight, holding physioball between ankles. 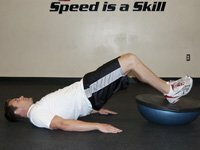 Bend knees and draw them toward chest; pause. 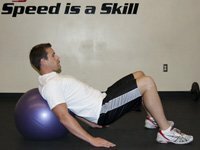 Return to start position with control; repeat for specified reps. 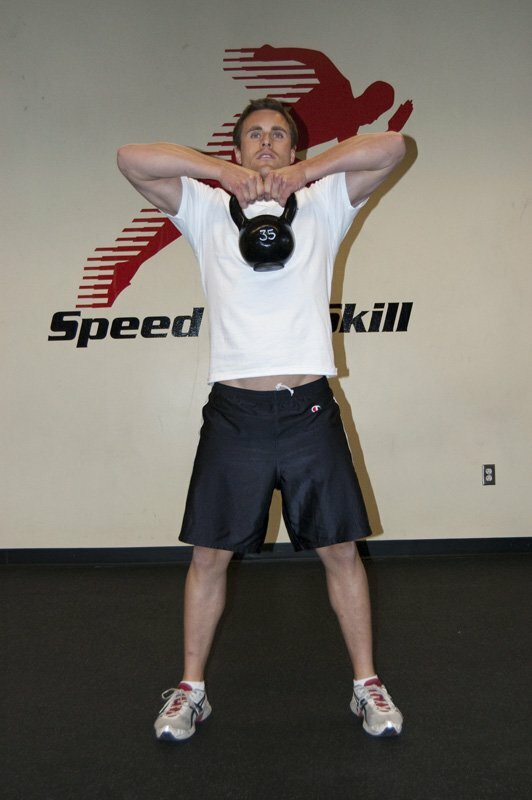 Perform holding a kettlebell with both hands in front of you. 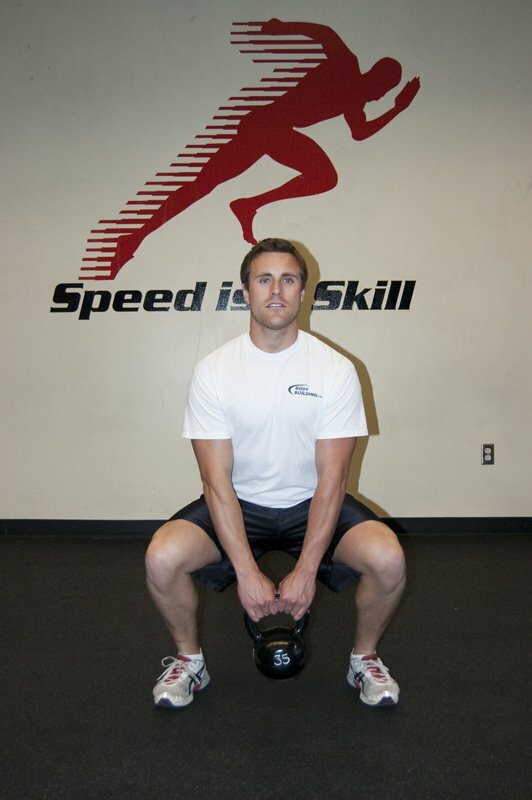 Squat down, flexing your knees and hips until the kettlebell touches the ground. Reverse the motion, driving through your heels. 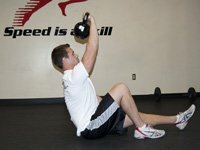 At the top of the motion, perform an upright row, bringing the kettlebell to chest level. 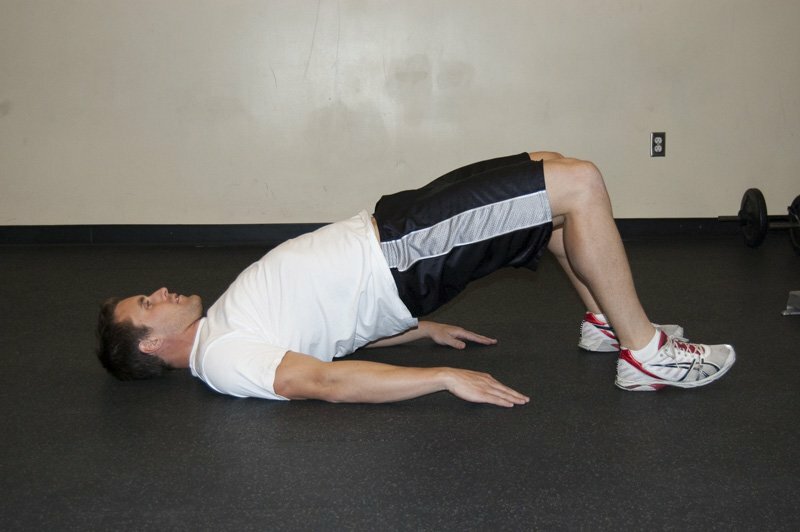 Lay on the floor with one leg straight and one leg bent. 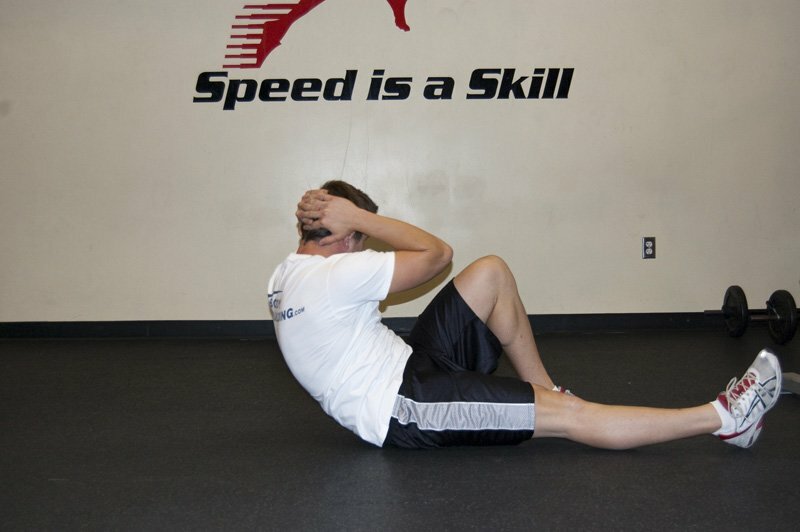 With your hands behind your head, sit up crossing the elbow to the opposite knee as you come to an upright position. 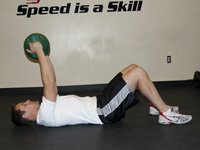 Support yourself in the pushup position with your hands on a medicine ball. 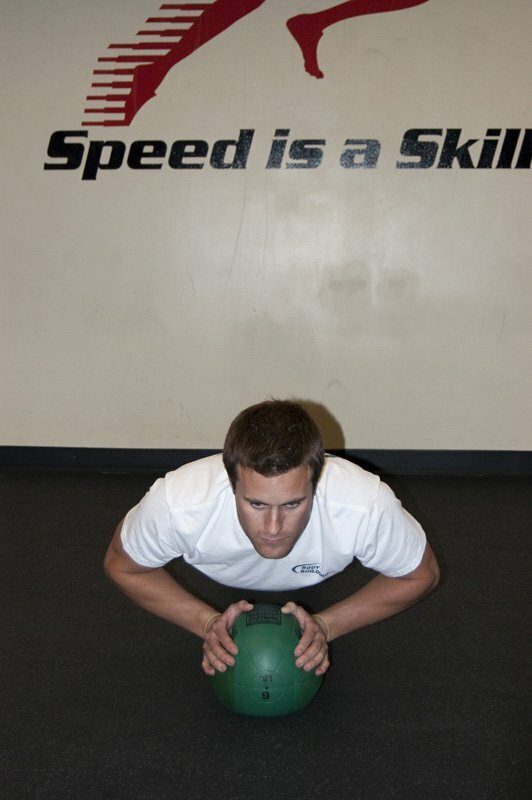 Tuck your elbows as you lower your chest to the ball, keeping your back straight. 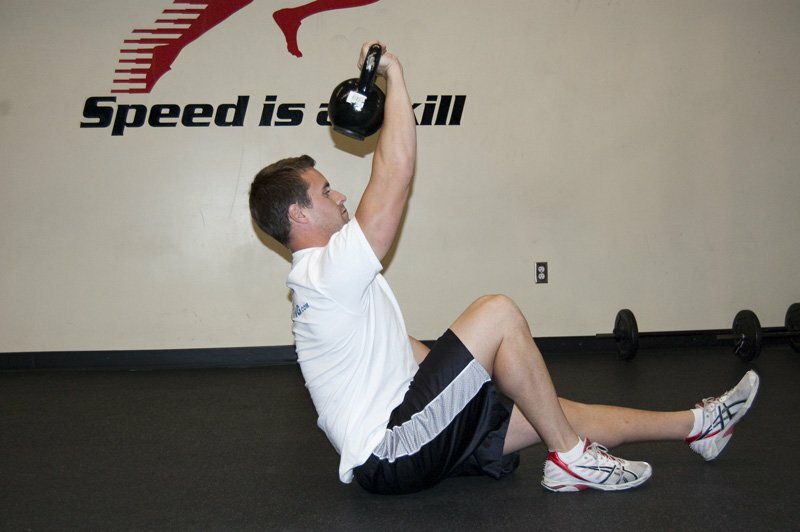 Internal/external rotation with a can. 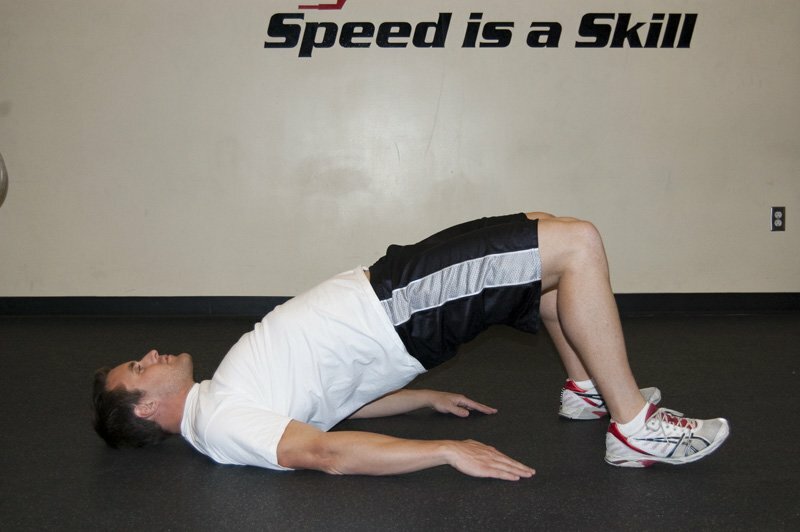 Angle 1 - Glute bridge: Lay one your back with feet flat on the floor and knees bent. 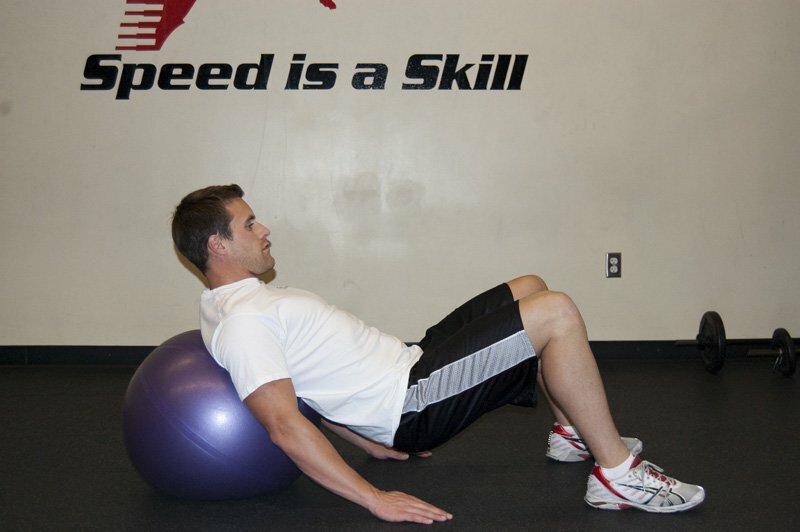 Drive through the floor to raise your hips. 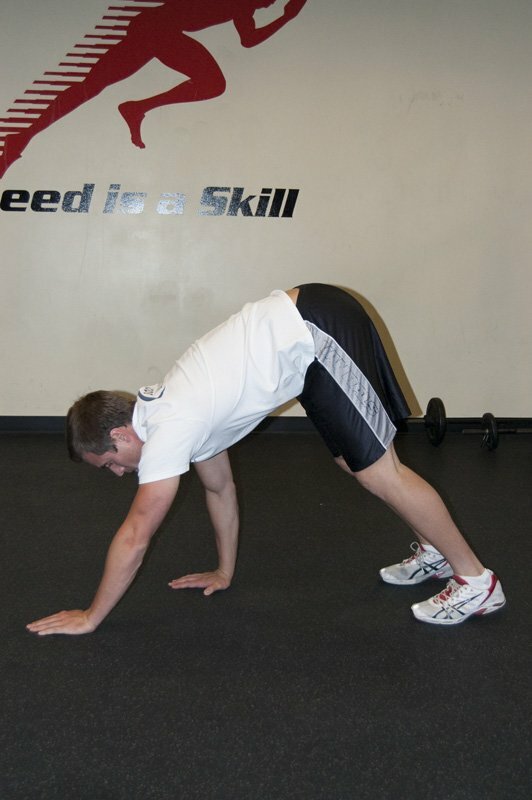 Angle 2 - Quadruped hip extension: Start on your hands and knees. 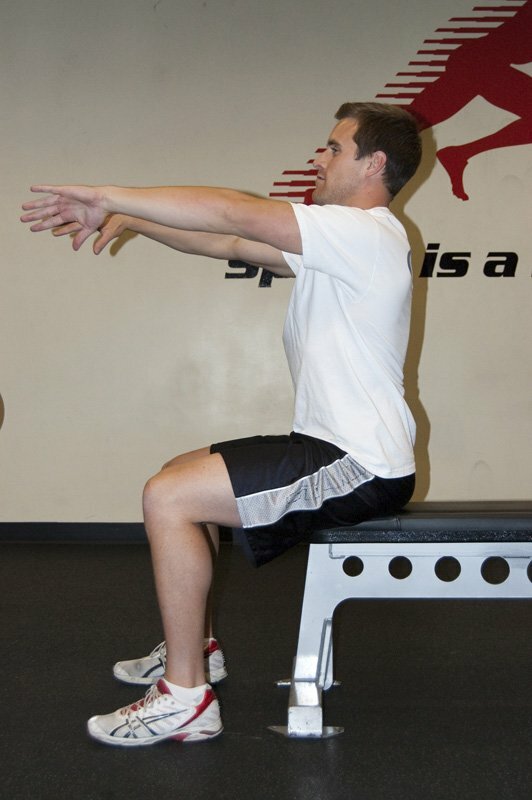 Extend one leg fully behind you, raising it as high as possible. 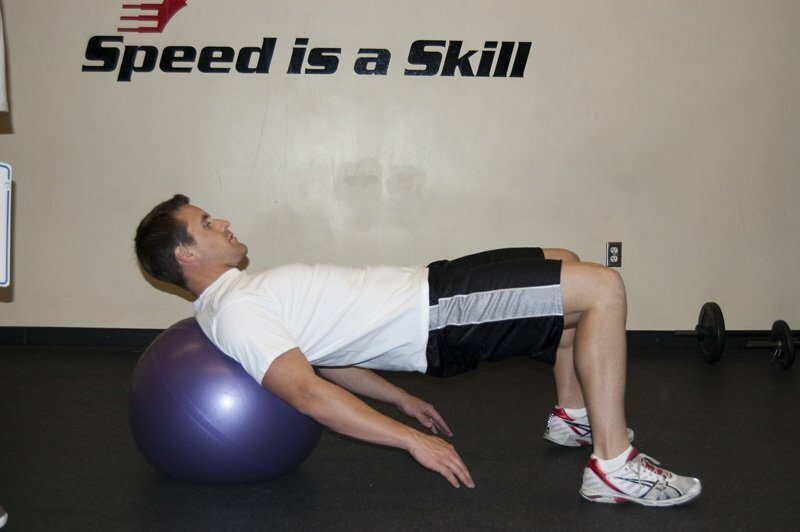 Angle 3 - Clam exercise: Lay on your side with your knees bent. 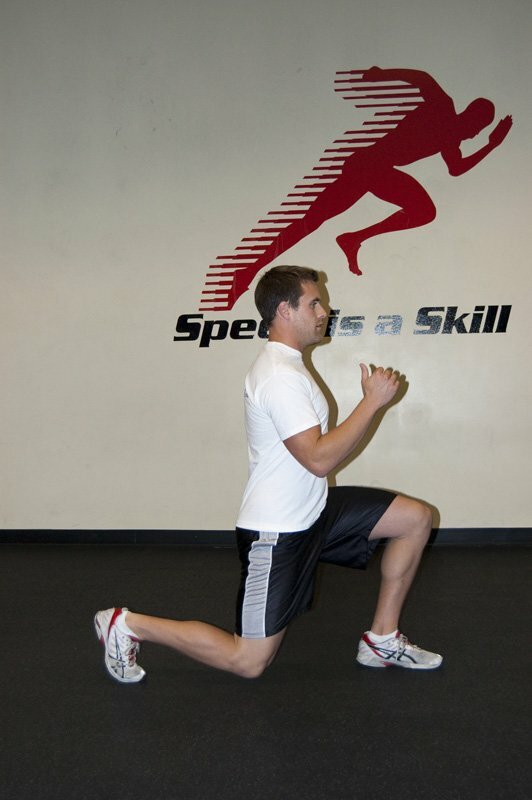 Keeping your feet together, raise your top knee as high as you can, lower and repeat. 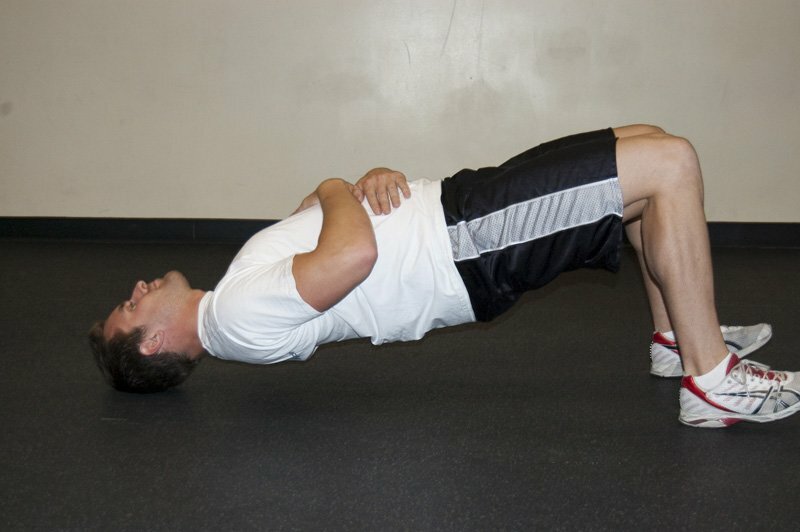 Lay on your back with your knees bent. Hold a stick above your chest, and do not move it. 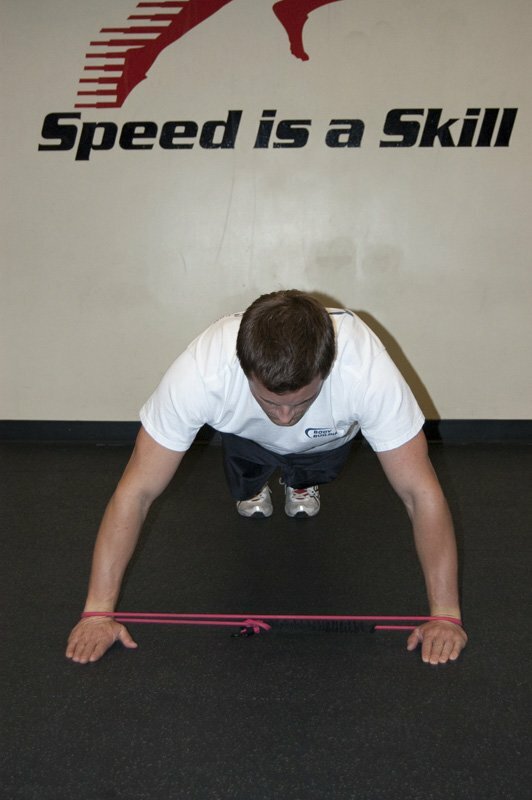 Raise your legs from the ground, bringing your knees to your chest until you can get your feet beneath the stick. 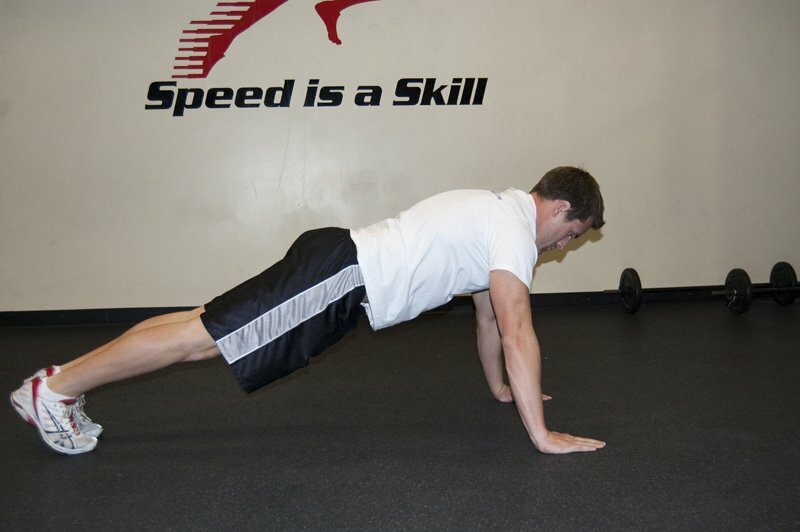 In the pushup position, allow your shoulders to retract, letting your upper body sag through the shoulders. 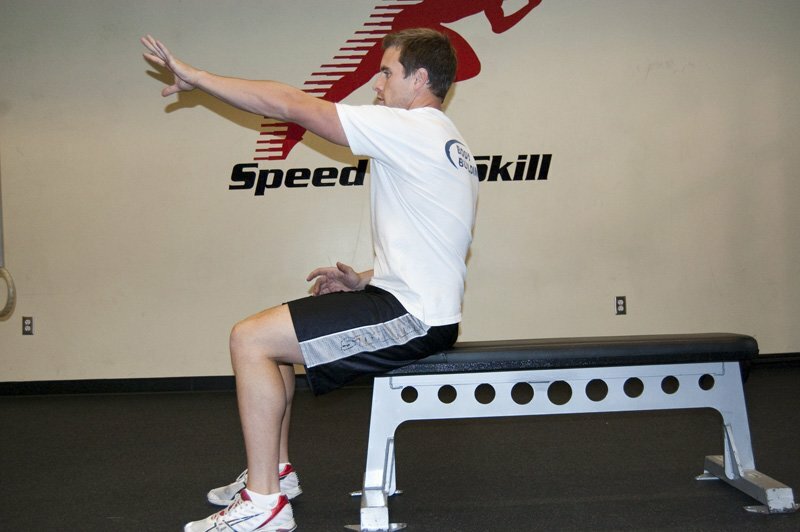 Reverse the motion by protracting your shoulder blades. 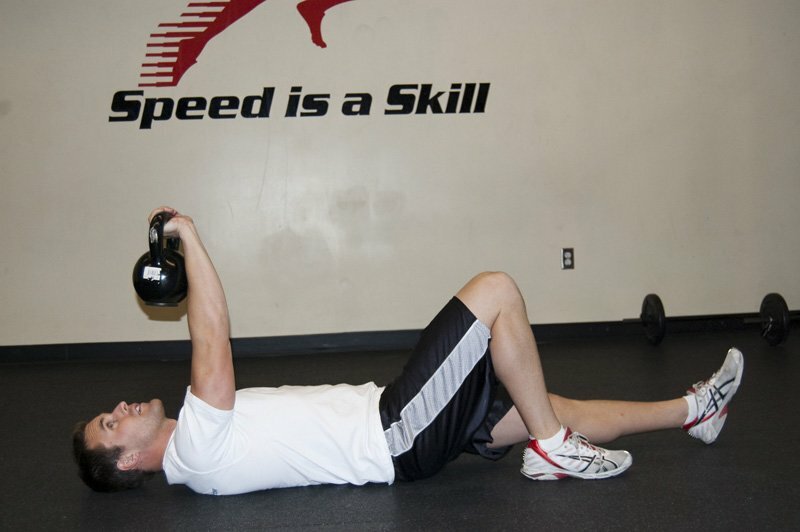 Lay on the floor with one leg bent and supporting a kettlebell or dumbbell directly above your chest. 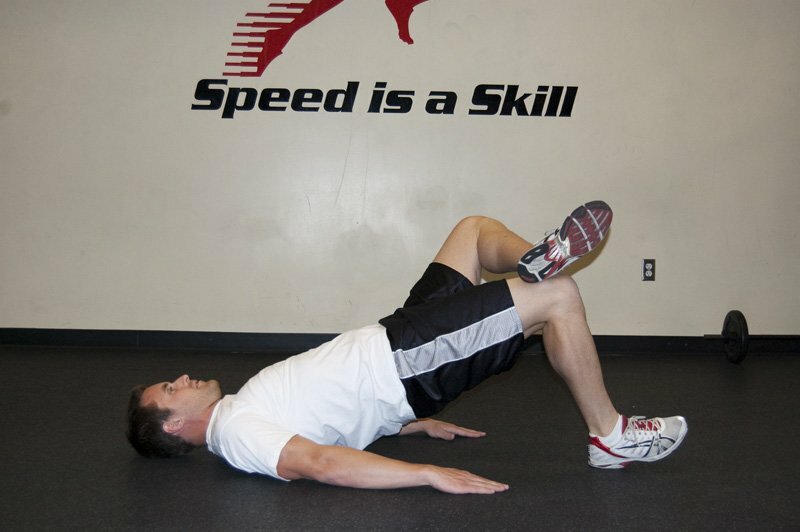 Perform the situp by flexing at the hips and spine to move your torso to a near vertical position. 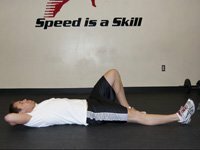 Lay on the floor with one ankle crossed over the other bent knee. 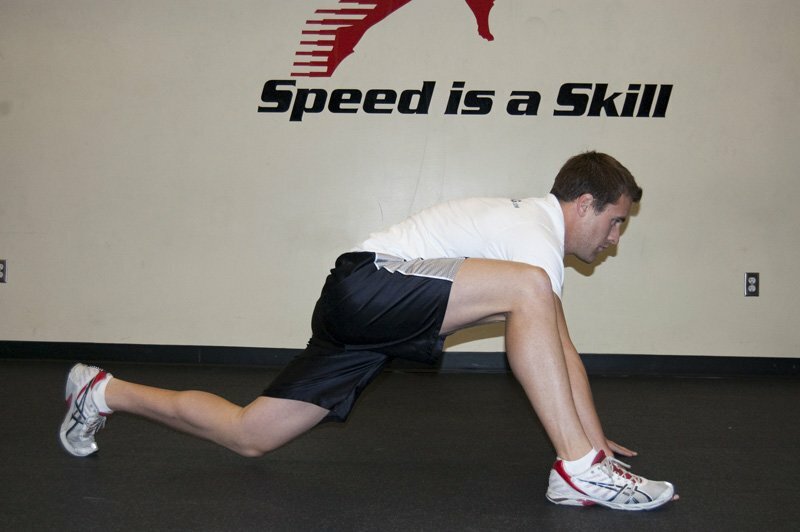 With the bent leg, drive through the heel to raise your hips from the ground. 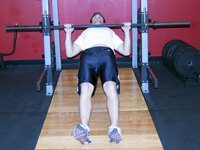 Using a bar supported in a rack, hang from the bar with your legs extended. 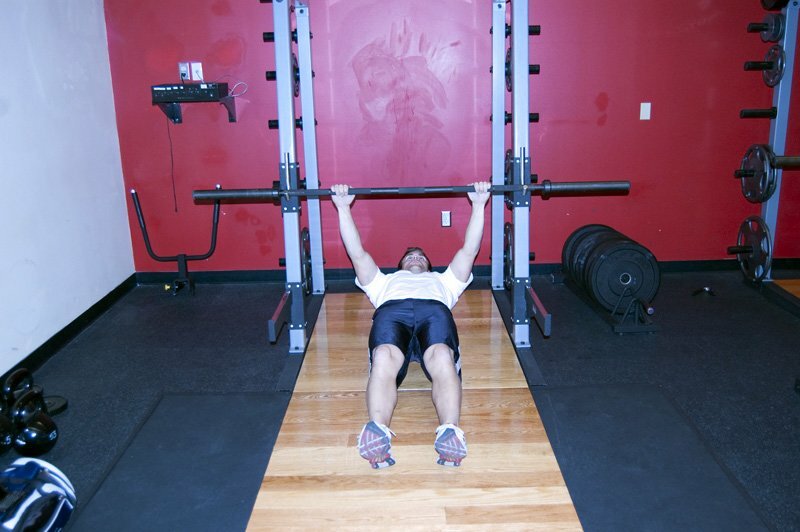 Use an underhand grip to hold the bar, with your arms extended. 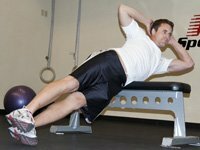 Begin the motion by retracting your shoulder blades, pulling yourself to the bar. 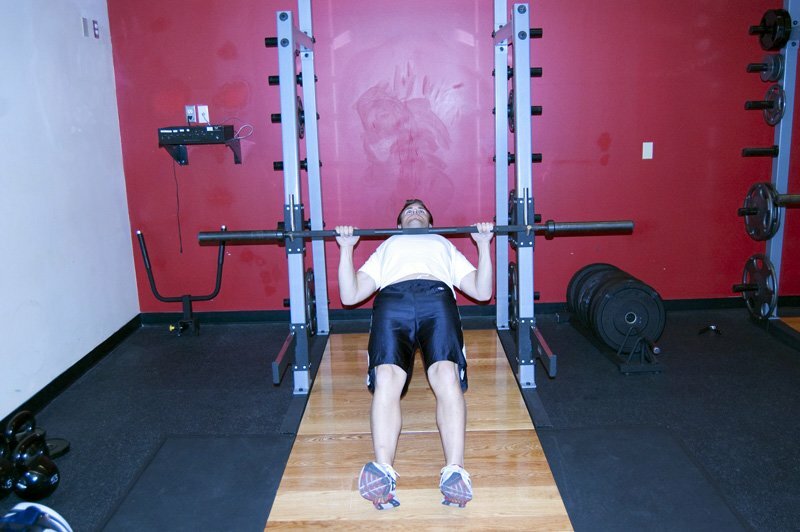 Rack a light barbell across the rear of your shoulders. 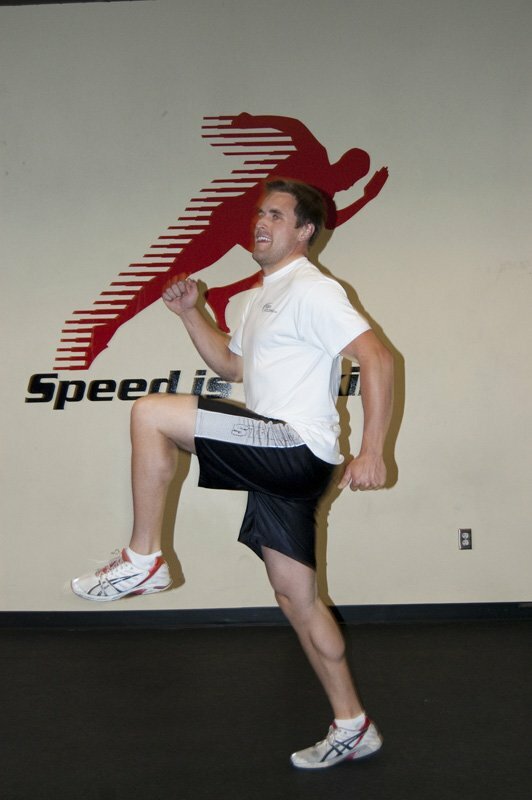 Facing the direction of travel, step forward with one foot and lower your hips until they are in line with your front knee. 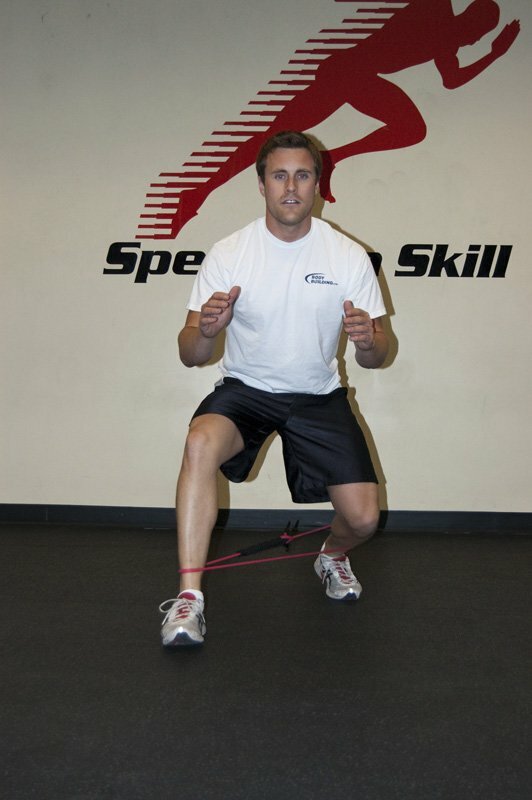 The knee should be above the foot. 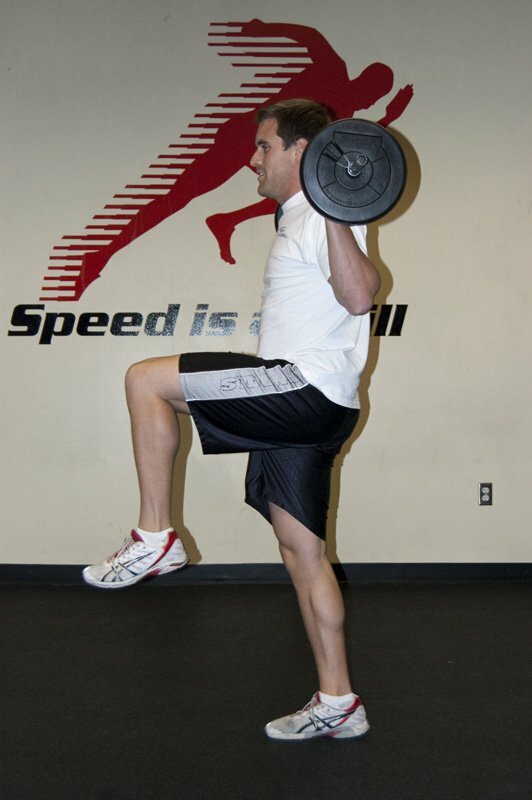 Drive through the heel to return to a standing position as you step forward with your opposite leg. Continue until complete. 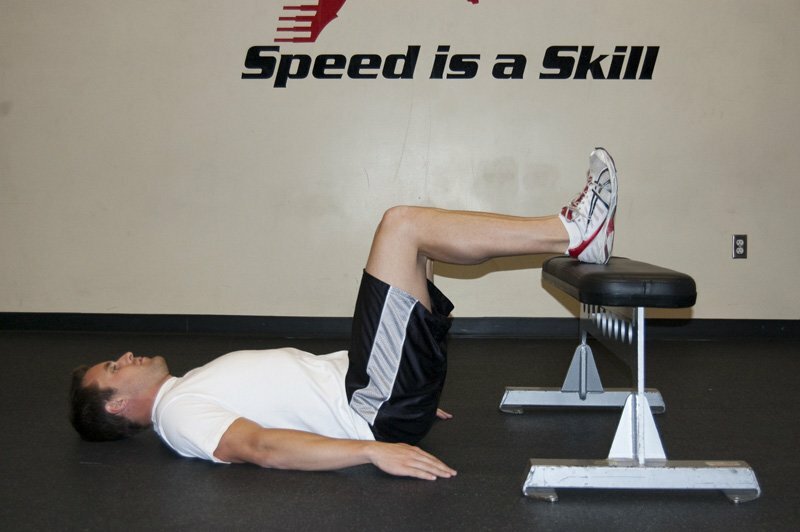 Start by laying across a bench so that it is placed under your hip. 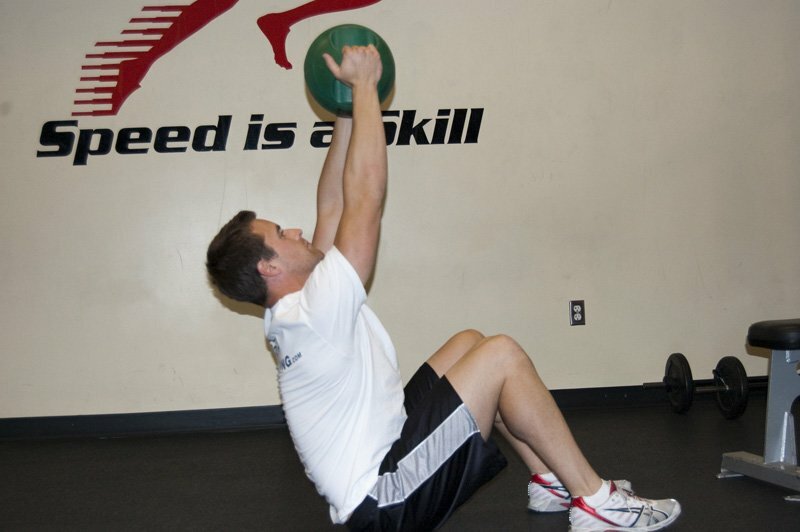 Laterally flex your body and raise your upper body up towards the ceiling. 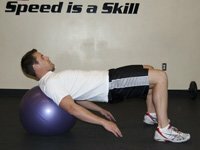 Keep your body parallel the entire time. 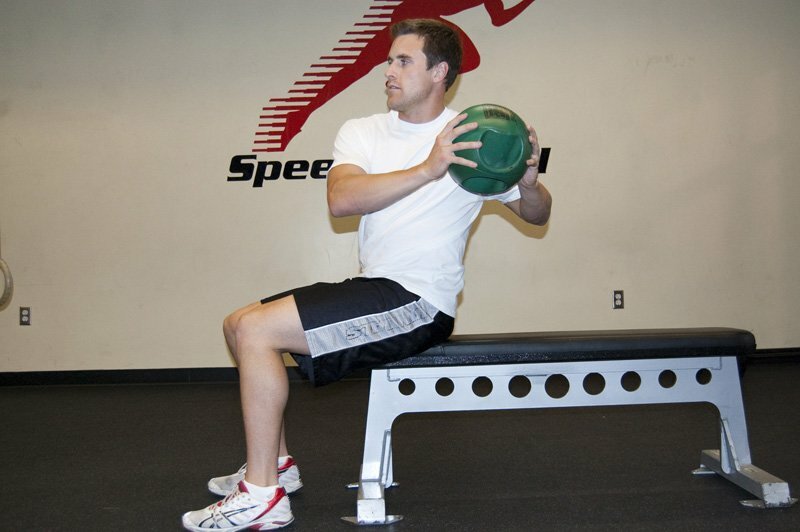 Seated, perform a chest pass with a medicine ball to a partner. 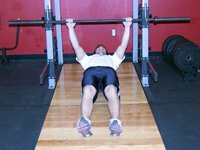 Standing on one leg in front a pulley, perform a row by drawing the handle to your torso, retracting your shoulder blade as you do so. 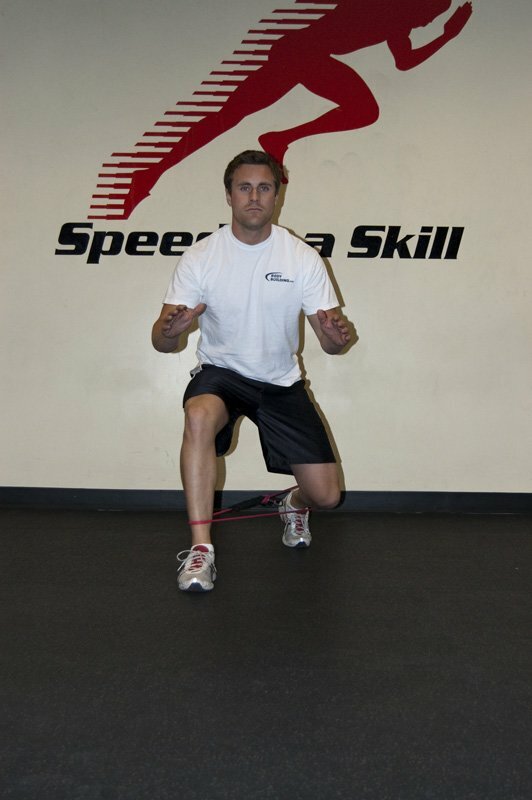 Position a band around the knees and keep the legs sufficiently apart to provide tension. 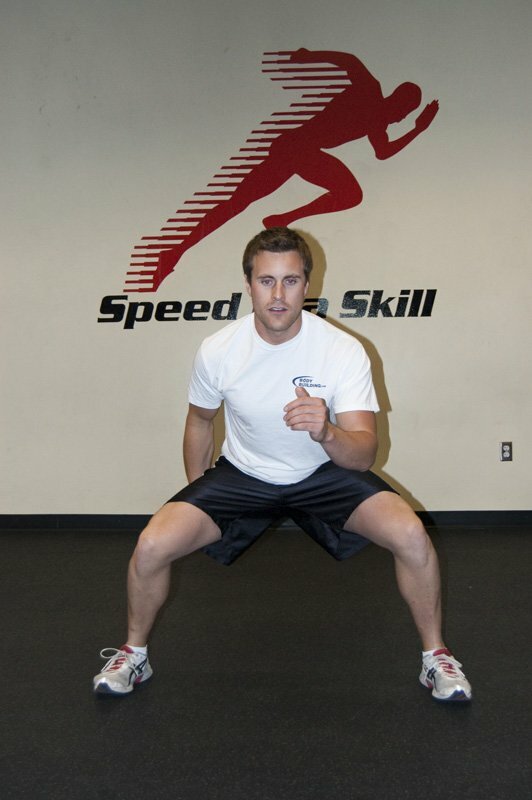 With your hands behind your head, perform squats with your body weight for the desired number of repetitions. 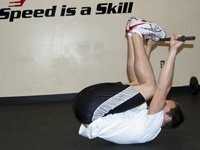 Begin by laying on your back with your legs straight up in the air. Crunch upward, rotating to one side as you do so. Alternate sides. Laying on the floor, place your feet on a bench. 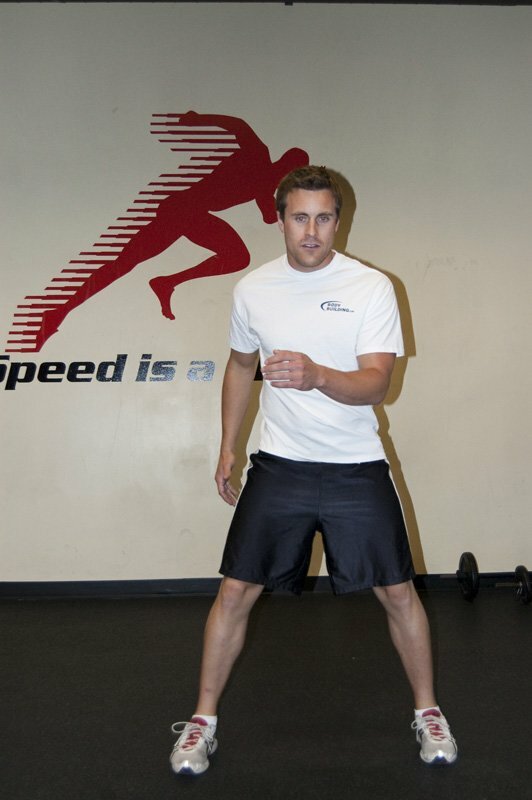 Begin by driving through your feet to extend your hips. 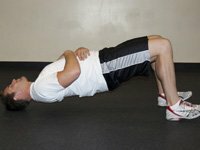 Your hands can be placed on the floor for support. 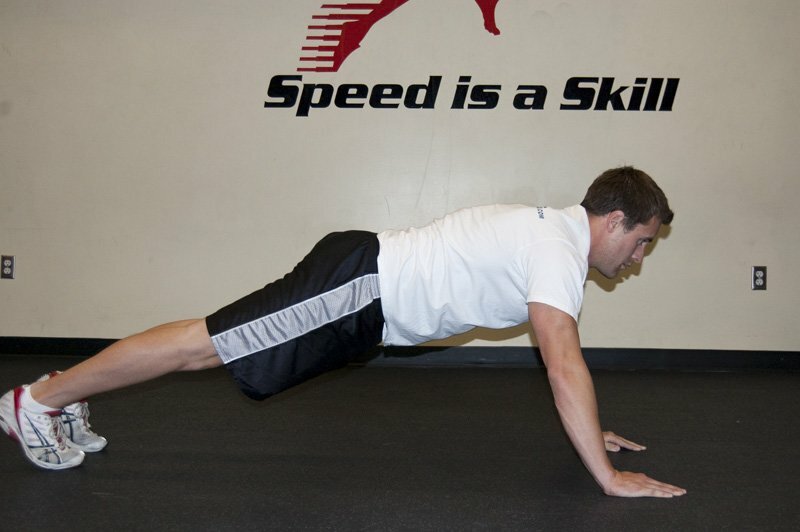 Begin in a pushup position, supporting your weight on your hands and toes. 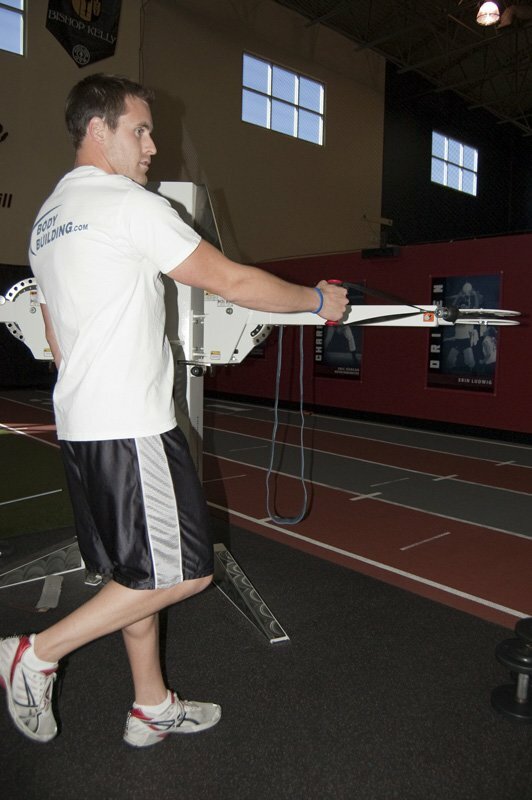 Under control, bring one foot up on the outside of your hand on the same side. 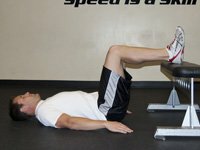 Attempt to push your hips to the floor as you do so. 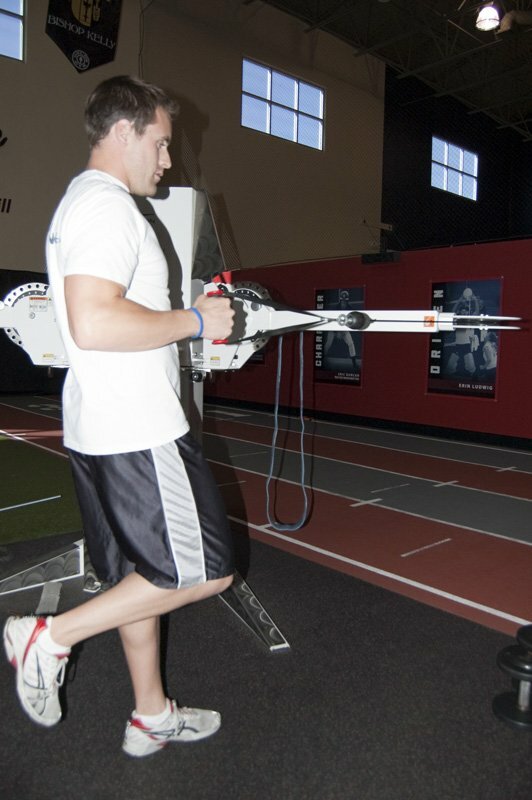 Return that foot to the starting position and repeat on the other side. Place band around the ankles. Keep feet a sufficient distance apart so as to provide tension. 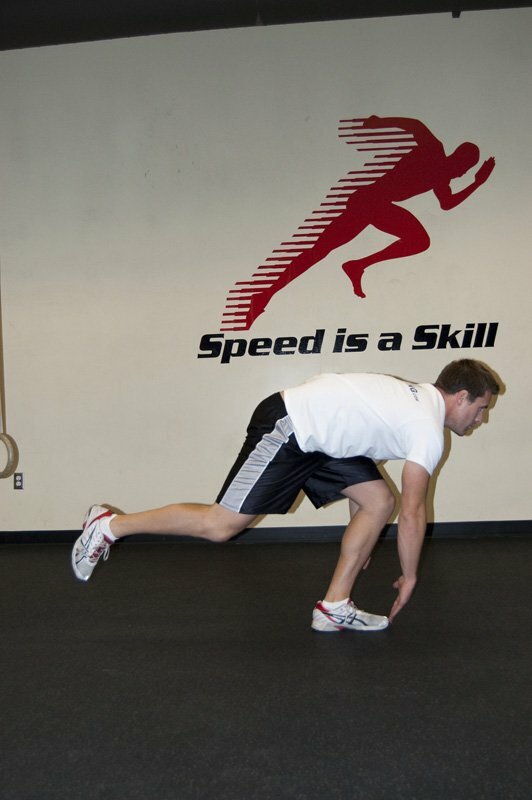 Perform slow walks in all directions. 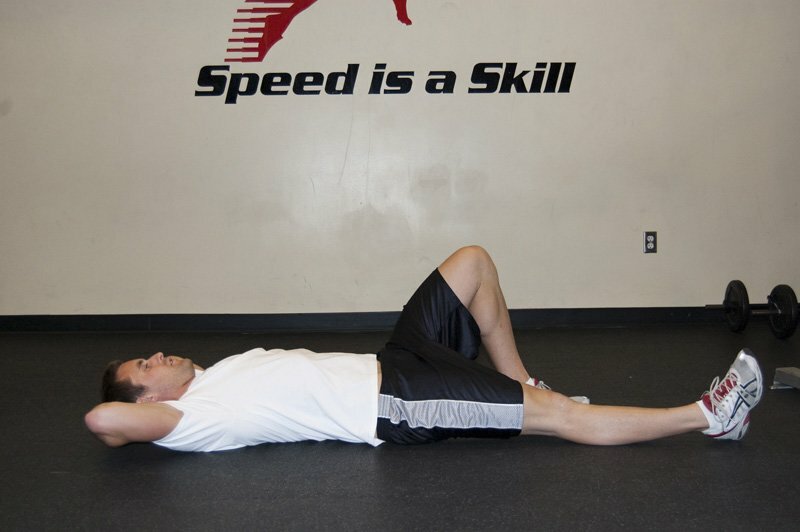 Laying on the floor with your knees bent, begin by driving through your feet to extend your hips. Your hands can be placed on the floor for support. 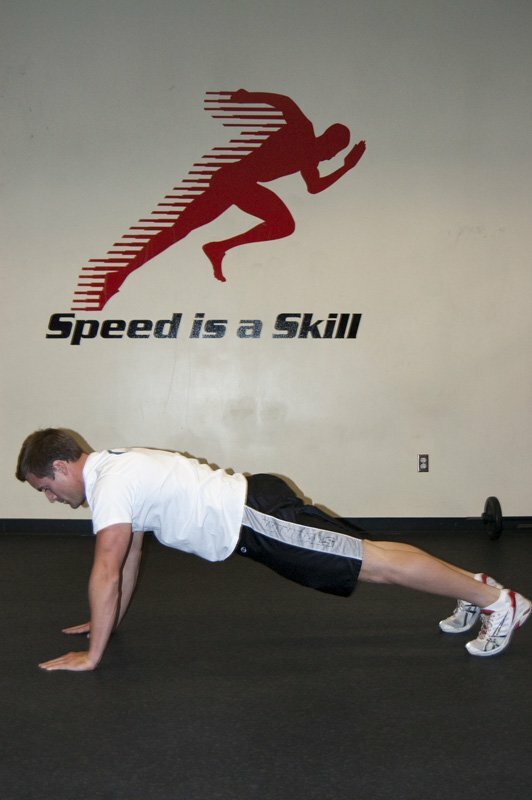 Facedown on the floor, support your weight on your toes and forearms, keeping your body straight. 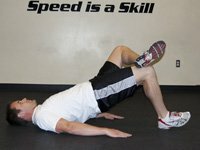 Laying on the floor with your knees bent, support your weight on your head as you raise your back and hips up off the floor. 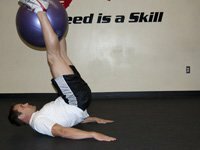 Hold a medicine ball above your head as you lay on the floor with your knees bent. 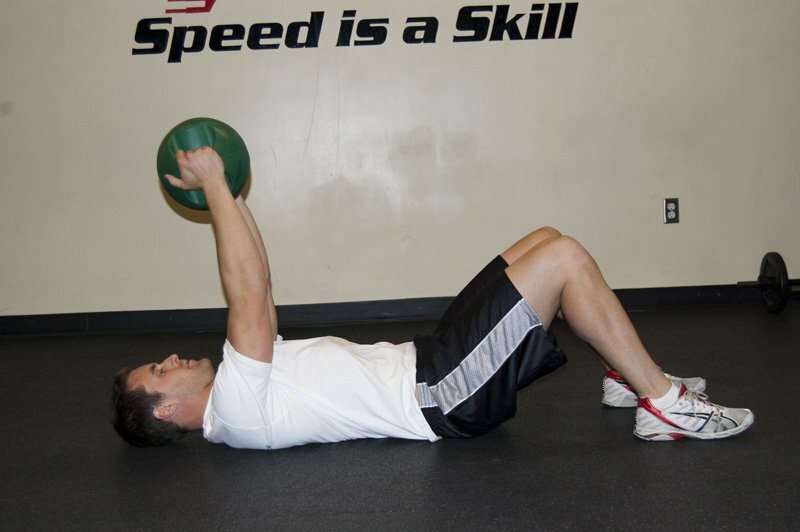 Sit up by flexing at the hips and spine to bring your torso to an upright position, holding the ball overhead. Stand on one leg. 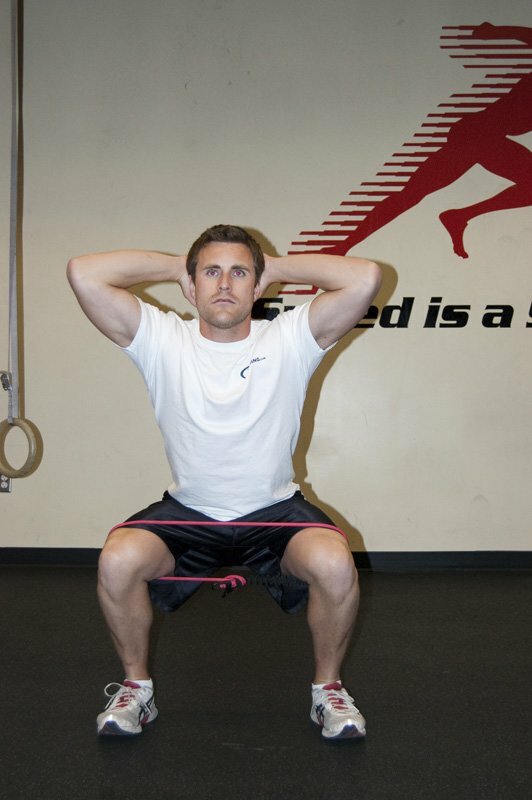 Squat down until you can touch your foot with the opposite hand, extending your free leg behind you. 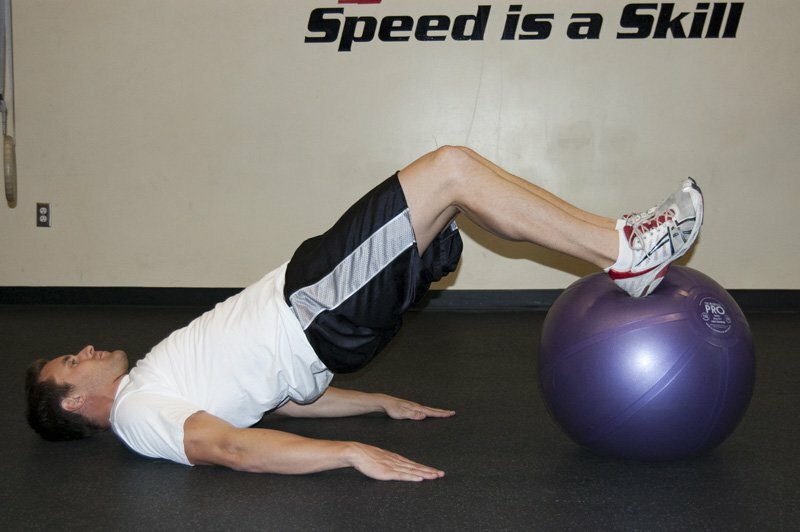 Lay on the floor with your feet on top of a ball. 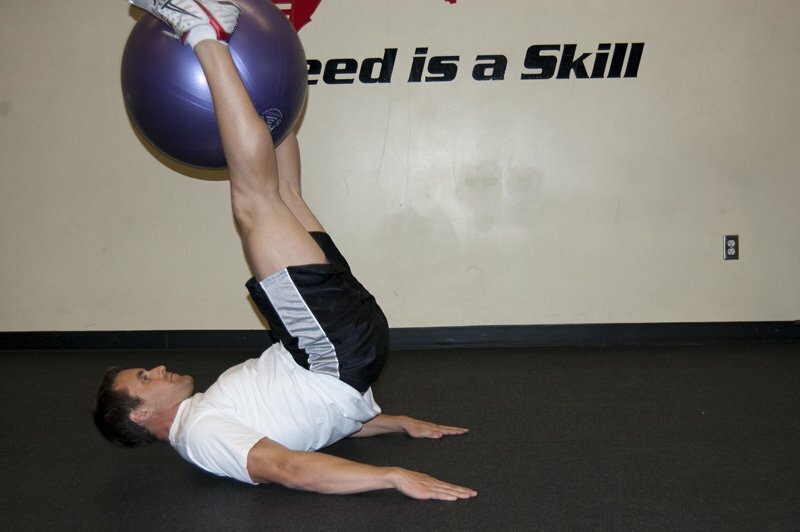 Bridge up, and perform a curl by flexing the knees, drawing the ball in towards your body. 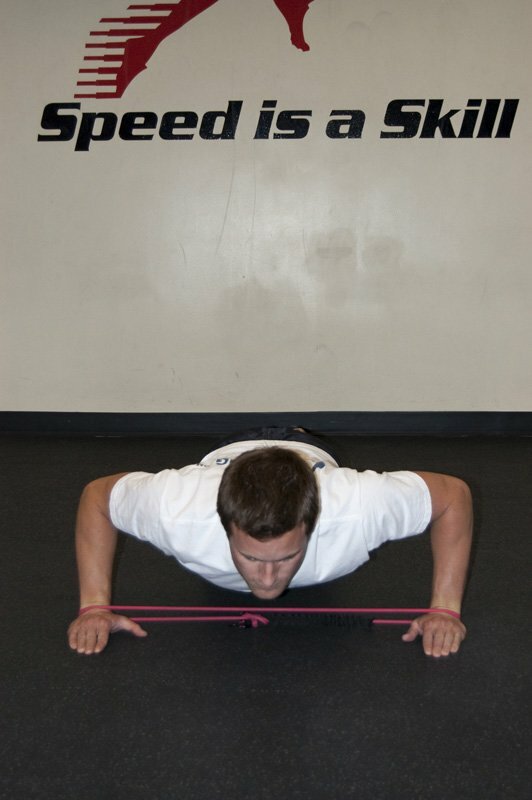 Place a ball a few feet away from a low cable. 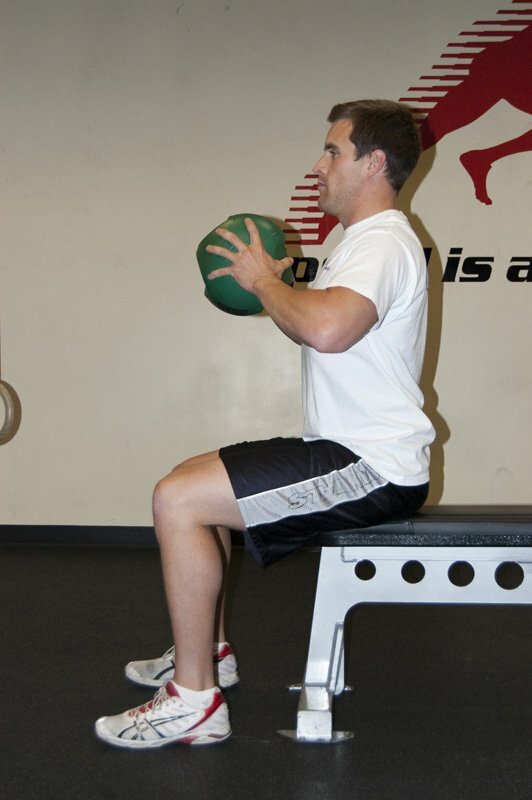 Support yourself by placing your middle back on the ball, and extend your arm out to the side to hold the cable. 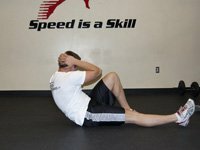 To perform the movement, draw your arm over your body. 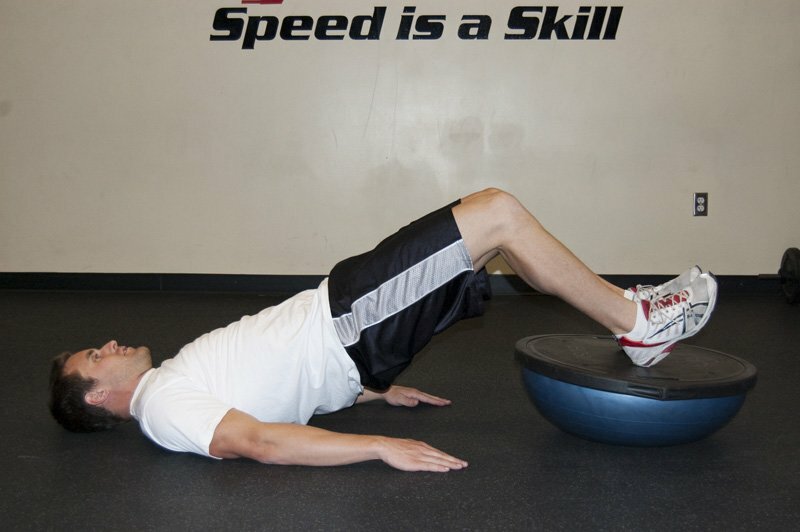 Lay on the floor with your feet on a bosu ball. 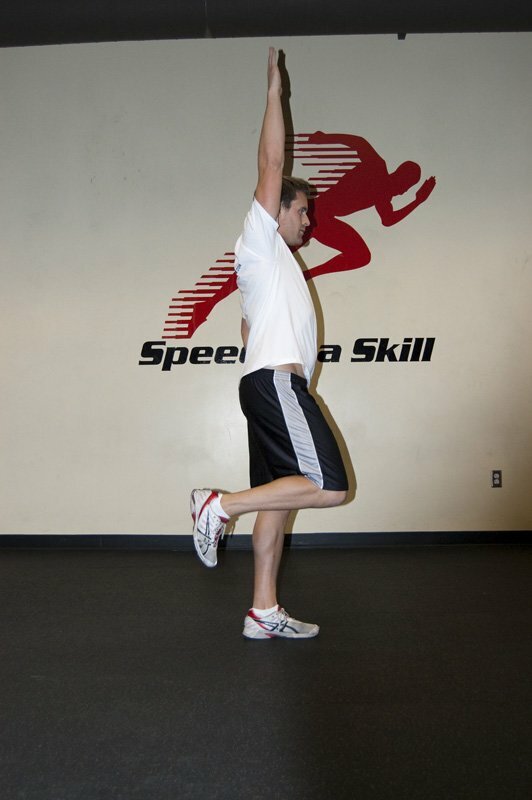 Drive through the heel to raise the hips.